New contracts appear every day. For example in purchasing, sales or service departments. It is difficult to keep an overview because most contracts include important deadlines and a variety of attachments. Even today, contracts are decentralized, which results in a lack of transparency within the company, deadlines are overlooked and cause high unplanned costs, and contracts are created in different templates, which leads to inconsistencies. As a future-oriented company, you should recognize early on that contract lifecycle management as a corporate initiative is already unavoidable today. 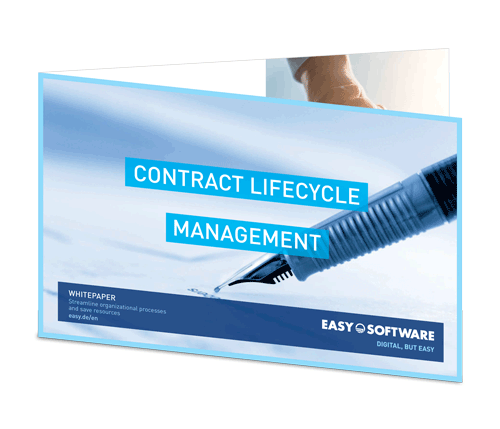 A software solution supports the entire lifecycle of your contracts – whether it is a service, support or maintenance contract or a rental, cooperation or purchase agreement. All of those contracts include background information such as information of the contracting parties. From contract creation to tracking and compliance, you get a real-time accurate picture of the risks and opportunities your organization faces. This saves valuable time and resources. Contract monitoring is carried out via multi-level deadline management: an escalation mechanism which automatically reminds you of upcoming deadlines. This ensures that critical deadlines are no longer overlooked. Ensures that every detail is clear and transparent to all stakeholders. Access and changes to contracts are documented at all times. Integrated version management ensures consistently high quality. Authorized representatives of the responsible departments always has access to contracts. This provides clear regulations of responsibilities. With the help of an integrated version management, access and changes to contracts are documented at all times. Contract management software offers high-powered search options, as well as convenient search and filter functions. Template management ensures consistently high quality and accuracy in the creation of contract documents. Integrate your contract management solution into your existing system architecture, database structure and workflows using open interfaces. Customize your contract management software according to your needs – such as your processes, language or content.